In 2002, the American Heart Association issued a scientific statement on Omega-3s’ effect on heart health. The statement endorsed raising our DHA and EPA levels by eating fish or taking a daily fish oil supplement. The American Heart Association statement reviews omega-3’s support of healthy heart rhythm, cardiac strength and blood vessel health. Studies show omega-3 fatty acids improve blood flow through the constricted arteries of heart disease patients. EPA and DHA help lower triglycerides, plus, EPA and DHA support normal blood pressure, while simultaneously increasing protective high-density lipoprotein (HDL) cholesterol. Higher HDL substantially reduces heart attack risk. For adults, omega-3s improve mood, memory, recall, reasoning, and focus and support brain health as we age. Chicago’s Rush Medical Center found people with the highest levels of DHA had a 60 percent lower risk of Alzheimer’s than those with the lowest levels. 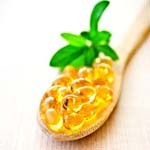 The University of Sheffield Psychiatry Department researchers found omega-3 fish oil supplements "alleviate" the symptoms of depression, bipolar disorder, and psychosis. The omega-3 EPA has a positive effect on inflammatory response. EPA competes with pro-inflammatory arachidonic acid in the body. This means EPA helps regulate body inflammation, which may benefit painful inflammatory conditions, such as arthritis. Patients with psoriasis, atopic dermatitis, and bronchial asthma also experienced benefits by supplementing with DHA and EPA. Reports of the beneficial effects on migraines caused excitement among millions of migraine sufferers. Decreased frequency and severity of migraine attacks were noted in a study at the University of Cincinnati. The majority of persons who took fish oils experienced a 40-50 percent reduction in migraine frequency and severity. Participants took nine fish oil capsules daily, with each providing 180 mg of EPA and 120 mg of DHA. Recent studies find taking fish oils improves insulin sensitivity and reduces insulin resistance in older adults. Since insulin resistance may lead to type 2 diabetes, this is welcoming news for many people who want to age healthily. The Norwegian Institute of Health established the role of omega-3 fatty acids in controlling diabetes. The study shows giving cod liver oil to children during their first year of life reduces the juvenile diabetes risk by as much as 25 percent. Omega-3s strongly support brain health also. Many pregnant and nursing mothers shape their baby’s intelligence and happiness by supplementing with fish oil. Exciting studies show children (and adults) with attention deficit disorder (ADD) and attention deficit hyperactivity disorder (ADHD), dyslexia, dyspraxia, and compulsive disorders experience a greatly improved quality of life when taking a daily dose of approximately 700 mg of combined EPA and DHA. Evidence suggests EPA and DHA deficiencies may contribute to childhood disorders, such as autism. One study examines the effects of a 1.5-gram daily dose of omega-3 fatty acids (840 mg EPA and 700 mg DHA) in autistic children ages 5 to 17 years who exhibited severe tantrums, aggression, or self-injurious behavior. The children’s behavior improved, suggesting omega-3 fatty acids may be an effective treatment for children with autism. We simply cannot afford to ignore the lifelong benefits of fish oils. At every age, from the cradle to our golden years, omega-3s help keep us vibrantly healthy, strong, and sharp! Dietary supplementation with n-3 polyunsaturated fatty acids and vitamin E after myocardial infarction: results of the GISSI-Prevenzione trial. (Journal of Affective Disorder Vol. 48(2-3);149-55). Am J Clin Nutr. 1986;43:710.